Are you looking for an effective dandruff treatment? We have all been there. You are all glammed up in your favorite little black dress, ready to party the night away. After a few hours, you see white flakes on your dress. Nope, there is no change in weather. It is not snowing. It is dandruff and this can be one of your most embarrassing moments in your life. Well, do not panic. The good news is it can be treated. According to our hair growth vitamins expert you can still wear your favorite little black dress soon. Dandruff is a form of skin eczema, which is called seborrhea. It is a usual form of skin eczema that can occur in any part of the body, like face, ears, chest, scalp, underarms or other parts where more oil is produced. On the scalp, dandruff is the manifestation that you have seborrhea. It is more common in males than females because their scalp produce more oil. How would you know if you have dandruff? Here are some symptoms: scaling of the skin which looks like white flakes, itchy and red scalp, inflammation, red blisters on the scalp, dry facial skin, and the like. A common misconception about dandruff is it is caused by dry scalp. This is probably because when it comes to the skin, once it gets scaly and itchy, the usual remedy is to apply moisturizer or lotion. But when the scalp becomes itchy and flaky, it does not mean it is dry. It is the other way around. Dandruff is actually caused by too much oil on the scalp. The overgrowth of yeast is the culprit. Excess oil and dead skin on the scalp is the food of yeast, which causes the skin cells to gather into flakes. Some would say that shampooing frequently is not good since it will dry out your hair. In this case though, you need to get rid of the excess oil. Not shampooing the hair can just aggravate dandruff. Oil and dead skin cells will accumulate, which means more food for the yeast and fungi. You need to get rid of those to stop dandruff and to do this, you need to clean your hair thoroughly. The thing is, ordinary shampoo cannot do the job. An effective way to completely eliminate dandruff is to use a medicated shampoo, which you can buy in drugstores or you can ask your dermatologist. Keep in mind that when using dandruff treatment shampoo, you need to let the product stay on your scalp for a few minutes before rinsing. If you want to moisturize your hair, you can still use conditioner after shampoo. If your hair is damaged, use the Rejuvenate Strengthening Protein Treatment after each wash followed by the Hydrate Conditioning Treatment. If your hair is healthy, use the Hydrate Conditioning Treatment after each wash. Once or twice per month, you can use the Rejuvenate Strengthening Protein Treatment followed by the Hydrate Conditioning Treatment. The Hydrate Conditioning Treatment restores moisture lost during chemical treatments and heat styling. It penetrates the hair to provide moisture within the hair shaft. The Rejuvenate Strengthening Protein Treatment rebuilds your hair structure and restores protein lost during chemical treatments and heat styling. It stops breakage, fortifies, and strengthens damaged hair. Remember, when using conditioner, apply from the middle section of your hair all the way down to the tips. If you have time, let the product stay for 10 to 15 minutes to let the hair absorb the moisturizing ingredients. For deep conditioning, use a shower cap and let it stay for 10 to 15 minutes before rinsing. Brush your hair to help distribute the excess oil on your scalp. Using a hair brush, brush your hair starting from the scalp. In this way, oil is distributed throughout your hair. This is a lesser known dandruff treatment technique. Do you love to use mousse, wax, hair spray, gel, and the like? You might want to try cutting down on hairstyling products first. These can also be the cause of your dandruff since hair products can build up on your scalp and can cause greasiness. On days when you really need to use them, make sure to remove and clean your hair thoroughly once you get home. Eating the right kind of food can also be an effective dandruff treamtent. You have to avoid junk foods, like pizza, burgers, and fried food. Fatty foods can make our sebaceous glands more active, thus bringing us back to the dandruff problem. Getting into a balanced diet that contains B vitamins (egg, whole grain cereals, white potatoes, lean beef) , zinc (red meat, fortified cereals, whole grains, dairy products), omega-3 fatty acids (coldwater fish, broccoli, grape leaves, canola oil), and selenium can help. To address the growth of yeast, you can also eat yogurt or probiotic supplements. Taking vitamins, like Hairfinity Hair Vitamins, is not only good for your health, but also for your skin and hair. Aside from taking in vitamins, do you know that your scalp also absorbs Vitamin E every time you take a walk outside? Well, you do not have to spend the entire morning out in the sun. Short or very quick walks are enough to keep your scalp healthy. Remember, sun exposure can also be harmful to your hair. If you are staying out for quite a while, use a hat, preferable a wide brimmed hat. There are hats made of UPF (ultraviolet protection factor) fabric, which could be the best weapon of your hair from the sun’s harmful UV rays. Also, take note that if you are using an anti dandruff shampoo, read the instructions carefully. Some dandruff treatment products can make your scalp sensitive to UV light, which means you need to avoid sun exposure. 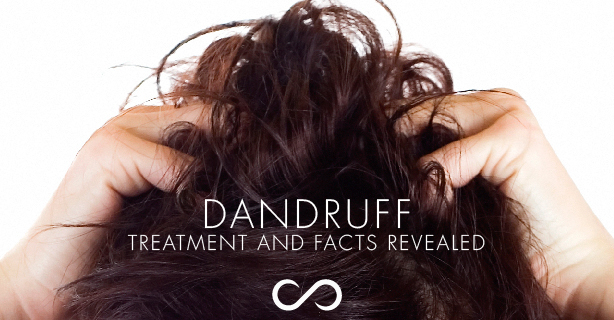 Some studies show that stress can trigger dandruff. So, relax. Spend time with your loved ones, watch a movie, eat in a good restaurant, or do whatever that will let you forget about stress. Try to exercise too. Living a healthy lifestyle will show on your skin and hair. If you know you have dandruff, save yourself from embarrassment by wearing light colored clothing. Dark colors will only make the white flakes very obvious. This may not be part of the dandruff treatment but it is a good reminder. Well, getting embarrassed can also cause stress, which can aggravate dandruff. So, you have tried several medicated or dandruff treatment shampoos and you already did all the tips stated above, but you have not noticed any improvement. Should you try other medicated shampoos out there? You have to take into consideration that the flaking and itchiness may not actually be dandruff. Skin irritation or inflammation can also cause these. Harsh hair products can bring about allergic reaction or dryness on your scalp. For a mild shampoo, use a sulfate-free shampoo like HAIRFINITY Gentle Cleanse Shampoo. It is a moisturizing shampoo that uses organically based emulsifiers with a base of Aloe Vera gel, taking advantage of its healing and moisturizing properties. It has a rich lather and a light, refreshing scent. Just apply one to two tablespoons to wet hair, making a lather. Repeat if necessary. And of course, if all else fails, you might want to take a trip to the dermatologist to properly diagnose the real culprit and to prescribe the right medication.